4.2 million Canadians are forecasted to have the disease by the end of the decade. A person with diabetes may suffer foot numbness, increasing the odds of injury. All kinds of Canadians neglect their feet, but that can be a life-altering decision for people with diabetes. The chances of having a toe or foot amputated due to an infected wound are about 20 times higher for a diabetic. And a lower limb amputation often starts a spiral of decline: up to two-thirds of patients die within a year. “There’s a high risk of death following amputation. In fact, the mortality rate is greater than some cancers,” explains Dr. Jan Hux, chief science officer for the Canadian Diabetes Association. That organization is on a mission to remind the growing number of people with diabetes to baby their feet like never before. Thousands of Canadians are expected to lose their toes or feet each year despite advances in care that have brought the rate of amputations down among diabetics. That’s because the sheer number of people diagnosed is forecast to rise to 4.2 million by 2020. There were 4,400 diabetes-related amputations across the country in 2008, the last year for which reliable data are available. That marked a small increase from 4,020 10 years earlier, according to the Canadian Chronic Disease Surveillance System. The road to the operating room starts with foot numbness called diabetic neuropathy. “Pain is an important defence mechanism. If you or I had a pebble in our shoe, we wouldn’t walk three steps without taking it out. The person with diabetes will walk on it all day,” says Hux. That creates a sore that remains unnoticed because nerves to their feet have been damaged due to high blood sugar and a lack of oxygen from poor blood flow. That same lack of circulation — again coupled with high blood sugar — creates the perfect environment for infections to grow. “They’re more likely to get an injury and they’re less likely to be able to heal it,” says Hux. 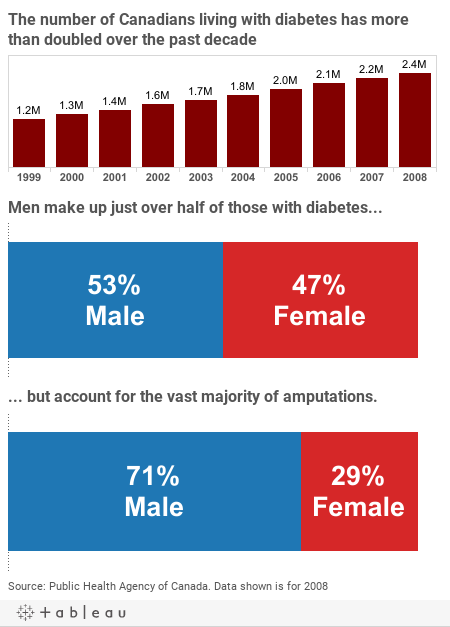 That’s why diabetes accounts for up to 70 per cent of all non-traumatic limb amputations. Wayne Sidsworth, a 56-year-old management consultant from Hamilton, Ont., watched the process claim his foot in a matter of days. He had been diagnosed at 37 with type 1 diabetes and thought he had it under control. It turned out that a blockage in the main artery of his leg — likely formed before he knew he had diabetes — couldn’t be repaired through several surgeries. He knew then his lower leg would have to come off, but was unprepared to watch a tiny cut on the sole of his foot transform from a dime-sized sore to a gangrenous limb over the course of a weekend. A surgeon removed it in an emergency operation on the Monday morning. His advice to others? Get diagnosed. Sidsworth believes he could have avoided some of the damage by getting his blood sugar down from its sky-high levels earlier. Hux agrees, but goes further. The CDA says 57 per cent of diabetics don’t follow doctors’ orders because they can’t afford the medical supplies to monitor their blood sugar levels or the medications that can help. As a result, only half of Canadians with type 2 diabetes have their blood glucose levels under control and therefore run the risk of slow-healing wounds along with heart disease, kidney damage and blindness. That’s why the CDA endorses proposals for a national Pharmacare program to make sure low- and middle-income patients receive proper care. “If people can manage their blood sugars well and have the resources they need to do that, then the damage to the nerves won’t happen. This cascade can be avoided where a barefoot walk in the park leads to a below-the-knee amputation,” says Hux. • Wear shoes that fit with clean socks. • Avoid going barefoot — even in the house — or wearing flip-flops or footwear that presses in one spot. • Check your feet daily for cuts, sores and cracks, using a hand mirror to see the bottoms if needed. • Don’t use over-the-counter corn and wart removers. • Seek help if you notice a wound. Foot specialists can offer advice for protecting a sore. • The CDA’s Clothesline program is collecting gently used shoes to distribute to homeless shelters across Canada. For more information call 1-800-505-5525 or download the Clothesline app to find the nearest drop box. Blood sugar. The key factor in all diabetes is the body’s inability to process sugar. It can be caused by a lack of insulin — the hormone produced by the pancreas to regulate it — or insulin resistance, which is a key indicator of pre-diabetes. Regular finger-prick blood tests throughout the day show diabetics their blood sugar levels so they make changes in food intake, exercise or medication to keep them stable. Uncontrolled high blood sugar causes damage throughout the body. Prolonged high or low blood sugar can cause a diabetic coma. Type 1 diabetes. Also known as juvenile diabetes, the disease is often diagnosed in children and teens and typically require insulin injections to stabilize blood sugar. It accounts for about 10 per cent of cases and is a serious chronic illness that requires a lifetime of attention. Type 2 diabetes. This condition is a fast-growing plague in North America that now makes up 90 per cent of all diabetes. It can be brought on by carrying extra weight, a lack of exercise and poor diet. It can sometimes be controlled by lifestyle changes. Damage to the body accumulates the longer it goes uncontrolled. The epidemic. In 2000, 1.3 million Canadians had diabetes. Ten years later that number more than doubled to 2.7 million. It affects every sphere of society, but has hit First Nations particularly hard, with prevalence about 40-per-cent higher than the rest of Canada.